When Iain Sarjeant got in touch about Amanda's book 'A Fluid Landscape', I was intrigued by the title as it describes the unique landscape of the Somerset Levels. In recent years this land, damaged by drainage, agriculture and intense peat extraction has, through various means been returned to marsh. We talked to Amanda to find out more about her passion for this particular landscape. I was given an Olympus OM10 for my 18th birthday and that is where the passion for photography began! I should add too, that in 1984 I saw the Josef Koudelka exhibition at the Hayward Gallery, and I was captivated by the magical and ethereal quality of the Gypsies series and the power of photography to communicate a story with such emotion, passion and power. You studied photography at West Surrey College of Art and Design and have an MA in Photography from London College of Communication. How did these experiences shape your photography? As an undergraduate student in the early 80’s, I was very much influenced by the documentary photography of that time (and earlier) and we were fortunate to have photographers such as Martin Parr, Paul Graham and Peter Fraser teaching on the course, which had a strong documentary focus. Through the early 80’s, ideas about what constituted documentary photography were becoming looser and expanding, from a traditional b/w journalistic approach, towards an approach that could be more subjective and more evidently a personal response. After I graduated, I worked as a documentary photographer for a good few years, on personal projects as well as commissions from organisations such as Impressions Gallery in York and Stockport Museums and Galleries on a major residency. The residency led me into teaching, and after a number of years of working in photography education, I signed up for the MA Photography at LCC. It was on my MA that I first started working in colour and investigating other visual approaches to exploring and questioning the world around me. Work and other commitments meant that travelling far and wide to make projects became impractical and I turned my attention to making work ‘close to home’ exploring with my camera the every day or the overlooked, in the places and people around me. 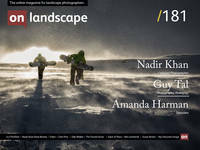 Why did you choose landscape photography as opposed to other genres such as portrait, still, documentary etc? I have worked in other genres, in particular still life and portraiture, but at this point in time I have become very interested in our relationship with the land, how it has been consistently bent to our service, how we constantly strive to control it, through farming, industry, horticulture, gardening … and the impact that these interventions have on our understanding of landscape and wilderness. Photographing in the landscape is my way of observing and exploring this relationship. Tell us a bit about the project 'A Fluid Landscape’. Where did it all start? How did it evolve? Following the floods in Somerset during the winter of 2014, I drove down to Somerset to see for myself; out of curiosity and a kind of nebulous idea about photographing the effects of the floods. Travelling around the area was difficult, many roads were closed and villages inaccessible. I spent the day stopping here and there, making some photographs. Weeks passed, the waters receded, the story dropped away, and I was occupied with other work. Looking back, this was the start of the project, a loose idea that led to a burgeoning fascination with this particular landscape. You seem quite connected to the marshlands of the Somerset Levels. How did you go about researching the locations you've included in the book? Later, in the winter of 2016/17 I was listening to Costing the Earth on Radio 4 (a source of much of my research!). Someone was describing how the ancient people of Somerset adapted to living and surviving in flooded landscapes, the kind of conditions that we now see as threatening and disruptive. They were also describing an area of newly created saltmarsh on the Steart peninsula, recently reclaimed from farmland by making a breach in the sea wall and allowing the sea to flood a large area at high tide. This controlled flooding would provide a buffer to flooding further upstream and create new salt marsh habitat. I was intrigued and so set out to explore this newly created landscape for myself. They were also describing an area of newly created saltmarsh on the Steart peninsula, recently reclaimed from farmland by making a breach in the sea wall and allowing the sea to flood a large area at high tide. This controlled flooding would provide a buffer to flooding further upstream and create new salt marsh habitat. What came first the idea for the book or the photography project? The photography project came first, photography is for me a way of engaging with and exploring the world around me and so my first instinct is always to get out there and observe, without any preconceived ideas about the outcome. The series 'A Fluid Landscape' was shortlisted for the Landscape category of the 2018 Sony World Photography Awards. What did this mean to you and how did it shape the rest of the project and book? By the Christmas of 2017, I had made many trips to the marshes and made many photographs of the landscape. I hadn’t shown the work anywhere but decided to enter a small selection to the Sony World Photography Awards in the Landscape category, and I was shortlisted! On the day of the announcement, I was contacted by Iain Sarjeant at Another Place Press, to say he would be very interested in publishing the project as a book. I carried on making work for the project, but I now had the focus of the book which led me to focus on other areas of the marsh, such as the woodland. From March 2018 onwards I worked with Iain on the planning and design of the book. Working with someone else to create an outcome for the work in book form has been a valuable and insightful process, and I have learnt a huge amount about editing, sequencing, listening and sitting with the work and the process. The images tell a story of the reclaimed marshlands of the Somerset Levels. What visual (and non-visual) narrative did you want to leave the reader with when you were working on this project? Sequencing is obviously important - how did you manage the flow of the images and visual narrative? The sequence was arrived at through a fairly organic process, I was very close to the work and somewhat overwhelmed by the quantity of images I had. I would say too that photographers are not always the best editors of their own work and I am always interested in how others see and respond to the work. I sent Iain a large edit of the work, and he came back to me with a tighter edit and a rough idea about the sequence. This contained a few surprises, and also a fresh way of looking at and organising the images. We went to and fro for a while with some other ideas and changes to the sequence and this was a very positive process. Gradually the book took shape and started to feel coherent. How did you decide on the format of the book and binding e.g. size and paper, print type? Another Place Press has a clear ethos which Iain was completely upfront about at the outset. His aim is to share exciting photography projects which explore our relationship with ‘place’ and importantly, to make them affordable and accessible to a much larger audience. Tell me what your favourite two or three photographs from the book are and a little bit about them. Certain images from the marshes stick with me, the hawthorn hedge in flower (AFL-5297), once a field margin, is now mingled with common reed, encroaching from the newly formed reedbeds. Photographed in February 2017, I really wanted to make some more images of the reeds and Hawthorn this spring. Spring was late, as I drove to work each day, I was looking out for signs that the hawthorn was about to flower. It was April before the blossom began to break and I headed down to Steart, knowing the place where the hedge and the reeds formed this beautiful, wavelike structure. As I approached the marshes, I could see that the hedges had been recently flail cut, there would be no blossom, and the shape of the hedge would be changed forever, reminding me that a photograph is always a moment in time. My working method is to spend time in an environment and to become attuned to what is there; this can take many visits, moving through what is surface, what is obvious and starting to notice what may not be immediately ‘visible’. The weather, the season, the state of the tide all have a big impact on how these landscapes look and feel, on the colours, the light, the amount of vegetation. My working method is to spend time in an environment and to become attuned to what is there; this can take many visits, moving through what is surface, what is obvious and starting to notice what may not be immediately ‘visible’. I started by looking out, across the landscape, but as I returned, again and again, I began to look inwards, at the interior; at plants washed with muddy tidal waters, (AFL-002) into drainage ditches buzzing with insect and plant life and through the complex tangles of branches, brambles and reeds that obscured my view at every turn. Could you tell us a little about the cameras and lenses you typically take on a trip and how their choice affects your photography? Starting out in photography in the ‘80’s, I grew up on analogue photography, only getting my first digital camera in 2006. I shot on medium format film for many years (Mamiya C220 and then a Mamiya 7). In 2014 I shot my very first project using a digital SLR (Canon 5D), and interestingly many people think this work was shot on film. I think this is to do with the subtle colour palette and the considered compositions, which probably carried over from all the years of only having 10 shots on a roll of 120! To make ‘A Fluid Landscape’ I used a Sony A7r with a 24 - 70 Zeiss lens and from time to time a tripod, I like to keep it simple, preferring to concentrate on the environment, the light and the image making, rather than the kit. I shoot RAW files and process everything in Lightroom. I just make basic adjustment to Levels, colour balance and I crop everything to a ratio of 5 x 7 as I find this format more visually pleasing to compose within. I then export to Photoshop for sharpening and possible further tweaks to contrast levels and colour balance, and that’s about it really! I always make small prints of everything I am interested in and have them up on the wall so that I can see at a glance how the ideas are working and how images work together to start to tell the story. This also helps me to understand elements that might be missing from the story and informs ideas for my next time out making photos. I am looking to make an exhibition of the ‘Fluid Landscape’ series, and I am currently researching possible partners and venues for a future exhibition of the series. Alongside this I have recently moved to an area that was once a centre for the woollen and weaving industry in Gloucestershire. I am currently researching and planning a project that will trace the evidence of this industry in the present-day landscape, and I have started researching, walking and exploring, using the digital camera to record some initial ideas which I will share on Instagram (@amharmanphoto). I am yearning to return to shooting film and dusting off the Mamiya 7, so after I have worked through my ideas and the way I would like to approach this project I will start making this work using the Mamiya 7.